Here’s a quick cast from Giants Stadium in East Rutherford, New Jersey. Roger just wrapped up his Live Earth concert appearance almost two hours ago. 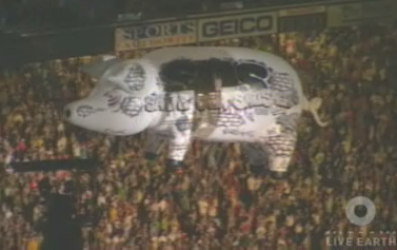 During Another Brick In The Wall, a special white pig appeared with “Save Our Sausage” written on the side. This was a great performance by Roger the band. You can watch it on YouTube but please go to Liveearth.org instead to watch any concert on demand and answer the call… sign the commitment… make the pledge! This entry was posted in Roger Waters, Soundboard by Doc. Bookmark the permalink.